July 15, 2009 Whistle Pig? So, a lot of you have known us as Whimzy Acres for many years. So what is the Whistle Pig? Well, we seem to have a family of Wood Chucks. They are the cutest things. John was just enthrawled with them. He was reading up on them on the internet and they are known as Groundhogs, and Whistle Pigs. Well, last night we planted grass! One more thing in getting back to normal! All around the new garage and the new sidewalk to the house. Wow...I won't know what to do when I don't have MUD and DIRT everywhere! Pretty soon they will be bringing in the rock to finish off the end of the driveway...yep I have a driveway! Haven't had one of those for 22 years! Well it seems that the spam monsters picked up my email address so I will type it out.. whimzyacres @ aol.com remove the spaces. Hi and welcome! My name is Shelley, I live in Nebraska with my husband John. We have three children who are all grown up and married. I have been crafting in one form or another all my life. I have been a soap and candle maker for 7 years. I also love sewing and creating prim things. They just bring back the feeling of a simpler time. I have always been a collector of things new and old and love to repurpose! Please come in and look around, we hope you will enjoy your stay here. Whimzy Acres is our home, also home to Whistle-Pig Primitives and The Junk Chick. We are Lucky to live right smack dab in the middle of the best farm ground on God’s green earth! Solar Lights on a Shoestring! 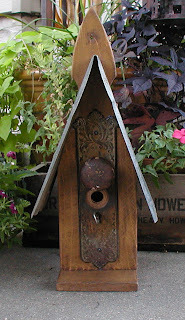 Every little birdhouse should have a locking door....and a key! I made this as a present for a friend for her birthday. Using old tin from my barn roof, and door plate and knob and key from ...well... the most fun place ever....a flea market!